One part of the story that isn't like a fairytale? Meghan had to make the difficult decision to leave one of her beloved dogs behind. Kensington Palace confirmed the sad news in a statement to The Blast. "This is a permanent decision that Meghan made on her own — not an easy one at that," he said. He added, "It takes a toll on an animal to travel so far across Atlantic combined with the hard, long process of getting approval. … It’s in the best interest of the animal’s well-being to stay." As Mercury News reports, the requirements for bringing a dog from the U.S. to the U.K. are intense and, in some cases, it's just not in the dog's best interest to make the trip. 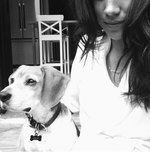 So, even though it was surely a devastating decision, we're sure Meghan had her pup's best interests at heart — and that she'll visit lots when she and Harry take their future Royal tours of the U.S. (because they HAVE to, right? ).